My mother-in-law made several GF treats this Christmas, and I’m very excited to share them with you! These cookies were a tradition in my husband’s family for his whole life, so it was fun to see them on the GF cookie platter this year! They really do melt in your mouth. Mix flour and cornstarch together and set aside. In large mixing bowl, cream butter and gradually beat in sugar; beat well. Add salt and vanilla; beat well. Stir in sifted dry ingredients; mix well. Refrigerate 2 or 3 hours. Shape dough into small balls, place 2 inches apart on parchment paper lined cookie sheet. 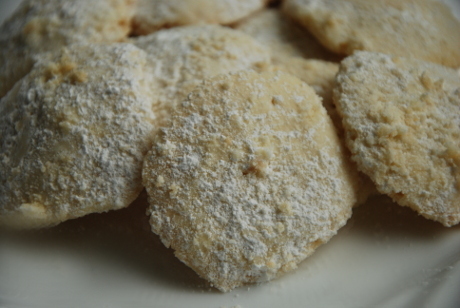 While cookies are still hot, roll them in powdered sugar.